NAU and Mohave CC have partnered to offer you a 90/30 Concurrent Enrollment Program in Nursing. Neal Campus in Kingman is on Jagerson Ave and accessed directly by College Ave.
NAU at MCC is one of our many statewide locations throughout Arizona. 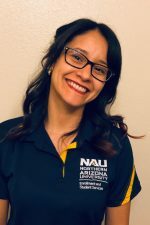 Learn close to home while accessing the same high-quality education, faculty mentorship, and student-centered experience that NAU has cultivated for more than 100 years—and earn the same nationally renowned, fully accredited degree when you graduate.